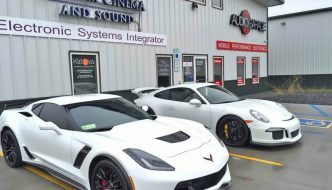 Audio Garage in Fargo is a specialist in marine audio. As marine audio experts since 2004, we have been passionate about building the best-sounding, most-reliable stereo systems in all types of vehicles. When you think about a day spent on the water, it typically brings fond memories. Our goal is to make those days even more special. When choosing who will work on your marine audio system, go to an expert. 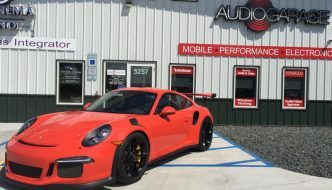 When you come to Audio Garage, you will deal with a team of experts who understand audio. Heck, it is even part of our name! We don’t work on outboards, and we don’t sell fish-finders. We specialize in audio. 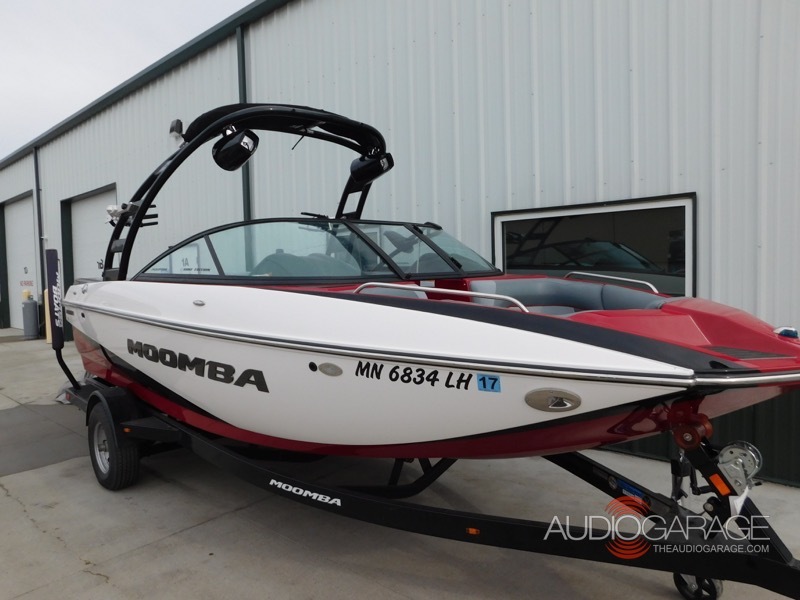 Over the years, we have seen many boats in our lot that had work done by a shop that said it could handle an audio upgrade, and it was evident they were out of their element. Marine audio is our element. One of the advantages of being an audio specialist is the finest brands in the business want to do business with us. What you won’t experience with us is a team member flipping through a catalog saying things like, “This product looks nice” or “A buddy said this worked well for him.” In our store, you will see products that were hand-picked by our staff for performance and value. 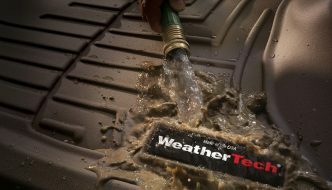 Since we do this on a daily basis, we know which products work best with each other. Have you ever heard of a fire in a boat? They do happen, and can be deadly. Or maybe you have experienced a dead battery while out on the water. That can ruin what was a wonderful day. 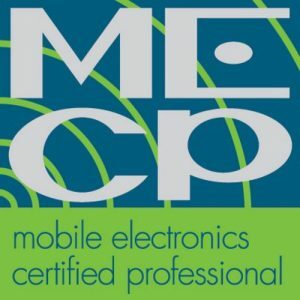 Our installers use reference-standard methods like solder and heat-shrink for connections, as well as neatly loomed and secured wiring harnesses. We take into account the current draw of your system and use multiple batteries and isolators to ensure you will always have the current to start your engine. We couple these thought processes with marine-grade materials, whether it is our hardware or upholstery. Even something like our speaker wire is marine-grade and designed to handle the current of a higher output system. Everything we do is designed to make your installation reliable and give you years of reliable service. Another area where Audio Garage is different is our system design approach. Our staff gets together with you and your boat, looks it over from bow to stern, and listens as you tell us how you plan to use it. We take this information, along with our expertise, and design complete solutions tailored to your needs. You get a better-sounding system with the features and benefits that make it more enjoyable. Whether you are adding a set of speakers and radio to your fishing boat, or want $20,000 worth of audio and lighting, we can handle it. We even offer paint protection for your boat, which will keep it looking new for an extended period of time. One of our popular upgrades these days is adding extra lighting to your boat. 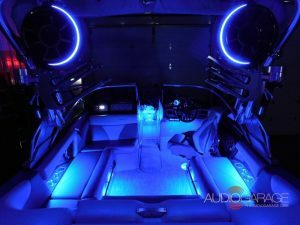 We have LED lighting for your interior, wake lights and even glow lighting for underneath your pontoon boat. From lighting to make it safer to maneuver around your boat in the evening to lighting that makes your boat stand out from the crowd, we have you covered. 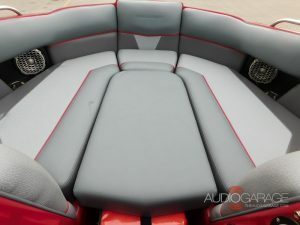 The next step in getting a marine audio system in your boat is scheduling a consultation with one of our highly trained staff here at Audio Garage. You can call us or click HERE for more information. Let us show you why more and more people every year come to us for their boat upgrades.